The number of farms in South Dakota declined by 2,021 in the last five years, according to the latest ag census. The average age of producers in South Dakota went up from 53.7 in 2007 to 54.3 in 2012, and 56.2 in the latest agricultural census. The latest numbers are in, giving a snapshot of American agriculture and how it’s evolved over the last five years. 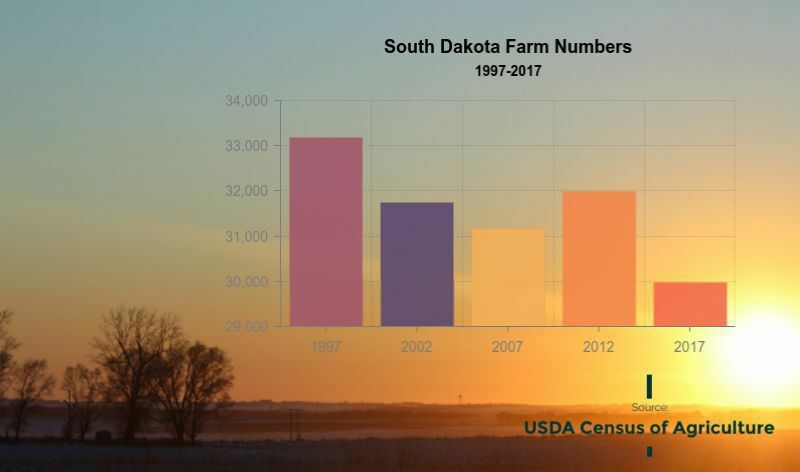 After showing a rare uptick in the number of farms in the last census, the number of farms in South Dakota declined by 2,021 between 2012 and 2017. The U.S. Department of Agriculture released the 2017 Ag Census on Thursday. The information was gathered in 2017, and it typically takes a year to prepare. The final numbers were delayed for an expected release in February this year due to the government shutdown. South Dakota had 29,968 farms, according to the 2017 census, down 6 percent from 31,989 in 2012. The number of farms in South Dakota grew by 820 between 2007 and 2012, bucking the national trend. At the time, South Dakota saw more hobby farms and an increase in the number of large farms. “That’s not going to be a surprise as some of our smaller operations go out of business,” said Erik Gerlach, South Dakota state statistician with the USDA’s National Agricultural Statistics Service. The census counts even the smallest hobby farm, as long as it produced $1,000 or more worth of products. Gerlach said a change in the number of those farms can impact the numbers. The average South Dakota farm size increased slightly in the latest census, from 1,352 acres in 2012 to 1,443 acres in 2017 — an increase of 7 percent. That includes land owned and rented. The total amount of land in farms across the state, at 43.2 million acres, was down less than 1 percent from the last report. About 89.1 percent of South Dakota is farm land, compared to 39.8 percent for the U.S.
South Dakota farmers sold $9.7 billion worth of ag products in 2017, down 4 percent from 2012. Slightly more of the revenue — 53 percent — came from crops as compared to 47 percent from livestock. The average farm made $81,763, down 20 percent from 2012. The age of producers continues to creep higher. 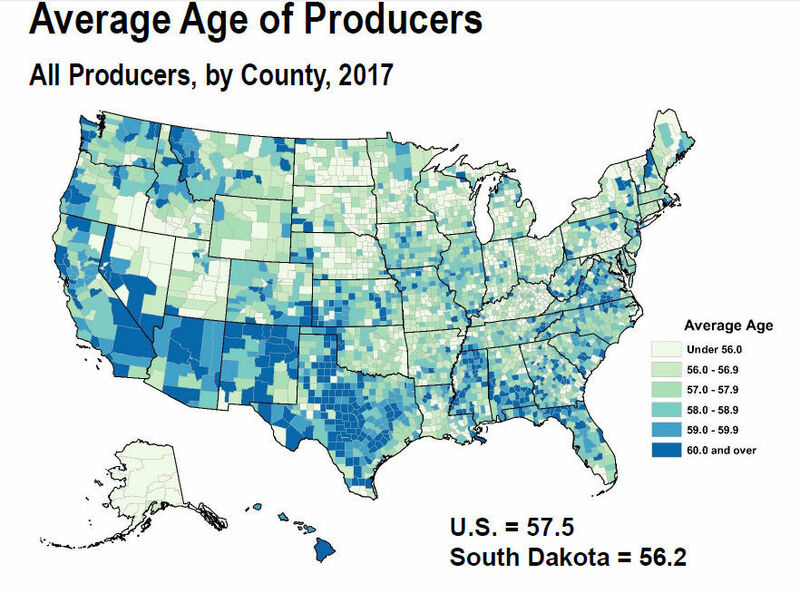 In 2017, the average South Dakota producer was 56.2 years old, compared to 54.3 years in 2012. The number of young producers, defined as 35 or younger, made up 12 percent of all producers. The number of female producers was 14,862, or 30 percent of all producers. South Dakota farmers have better access to the internet than farmers nationwide, according to the census. A total 81 percent of South Dakota farms reported having internet access compared to 75 percent for all U.S. farms. South Dakota farmers responded to the census questionnaire at a lower rate than the national average. The national response rate was 71.8 percent, and South Dakota's was 63.4 percent. “That’s a big problem in this state,” Gerlach said. South Dakota often has one of the worst response rates in the nation. This year it had the third lowest rate. Statisticians like Gerlach try to make up those numbers with accepted mathematical procedures. He said it’s important to have data on the state’s biggest industry. “If we want to talk about South Dakota agriculture, we can’t talk about it without the information from our South Dakota farmers and ranchers,” he said. Gerlach thanked producers who took the time to respond. The ag census is the only source of uniform, comprehensive and impartial agriculture data for every county in the nation, he said. Collecting data consistently allows people to see past trends and plan for the future. Legislators use the information for shaping policies and ag programs — which figures into funding, Gerlach pointed out. And companies and cooperatives use the data to decide where to put facilities to serve producers. He gave the example of a cheese factory looking to locate in Brookings. Having data on the number of milk cows in an area can show if there’s an adequate milk supply for the plant. “These census numbers mean a lot,” he said. Contact Janelle Atyeo at jatyeo@tristateneighbor.com or follow on Twitter @JLNeighbor.